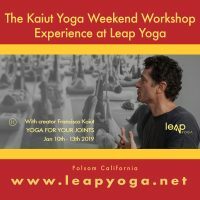 Francisco Kaiut brings his amazing yoga skills to Leap Yoga once more. Northern California is becoming a beacon for this restorative, beneficial, and developmental program! Experience new, dynamic and supplementary topics of discussion along with an expanded series of lectures, classes and poses as the founder of Kaiut yoga mentors and guides you. Kaiut yoga is all about bio-mechanical health, or said another way, "Your freedom of movement." Whether due to over use, lack of use, or injuries, as people age their mobility is compromised. Kaiut has been designed to improve a student’s joint health and mobility as they work through chronic pain, injuries, general aches, and stiffness. Kaiut is superb for all, including the inflexible, hyper flexible, and the aging.